Faculty in REL, and throughout the University, are experimenting with technology in their classrooms every semester. 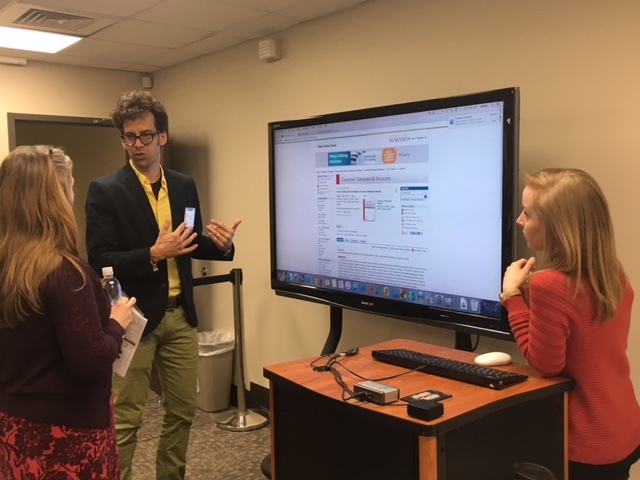 Last week the Center for Instructional Technology (CIT) hosted a showcase for faculty to share the cool stuff their are doing with technology in the classroom. The Department’s own Prof. Nathan Loewen presented his work in developing The College of Arts & Sciences Teaching Hub, a digital resource center that provides tools for faculty to improve and innovate in their teaching. Along with Jessica Porter, eTech’s Digital Editorial Specialist, Prof. Loewen presented features of the Teaching Hub and engaged the audience in dialogue about the site’s design, potential features and future content. In short, the focus of the Teaching Hub is to promote community, collaboration, and teaching innovation in the College; provide opportunities to develop and refine teaching skills throughout the year, including yearly workshops, peer coaching, and the common book event; identify and share resources regarding effective, research-based teaching practices; and foster cross-disciplinary conversations on teaching and learning, relevant to faculty members at any level. Because teaching with technology is so much more than just Powerpoint. This entry was posted in Faculty Blog, Public Events and tagged Nathan Loewen, Pedagogy, PowerPoint, teaching, teaching hub, Technology by admin. Bookmark the permalink.